MUNICH –(MunichNOW Book Review) — Robert Harris, best known for his 1992 alternative history novel, “Fatherland”, doesn’t re-arrange history in his latest novel, “Munich” but he does take a different look at an infamous period. Many historians criticize and even revile British Prime Minister Neville Chamberlain’s appeasement of Adolf Hitler during the meeting in Munich of England, France, Germany and Italy during 1938. 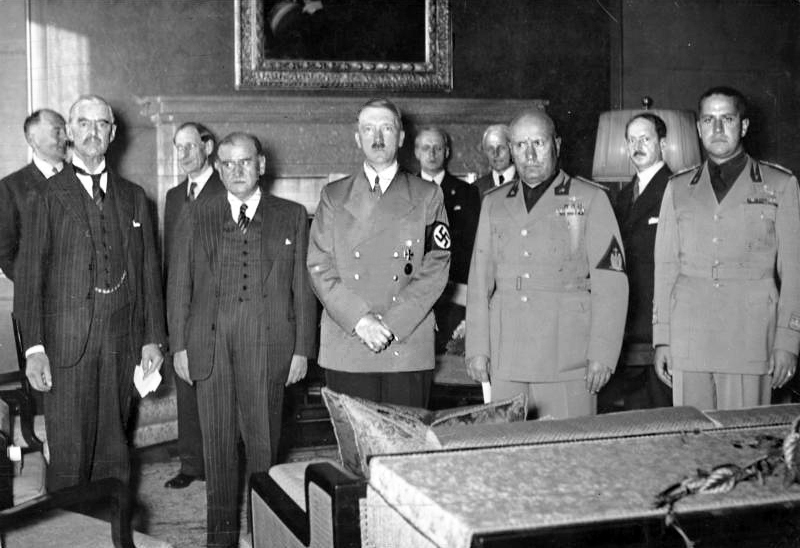 Hitler broke the accord, violently smashing the agreement by 1939, igniting into World War II. Chamberlain was pilloried and ousted as prime minister. His name has lived in the infamous shadow of appeasement ever since. In “Munich,” Harris recounts the loud, long praise for Chamberlain following Munich from the German people, the British, Americans, etc. — praise as the man who averted war and quelled the violent urges of Hitler. Harris subtly paints a picture of Chamberlain that isn’t so much naive, as optimism counterbalanced by pragmatism. “Munich’s” pre-narrative pages include a 1945 quotation from Hitler, said at a time when he could see Germany was doomed. Hitler said had he went to war in 1938, he would have won it all. Chamberlain arguably stopped Hitler’s plans for war in 1938. Also, in the early pages, Chamberlain learns that Britain is ill prepared for war; there’s a defect in its air forces’ planes. Harris does not harp on this note but Chamberlain’s demeanor toward Hitler’s demands shift after learning England’s planes cannot climb to necessary altitudes. As with most Harris novels, he sticks to research and historical fact to create the authentic framework for his fiction. Here, the fiction is the relationship between a secretary in the British prime minister’s office and a junior officer in the German Foreign Office. They were friends while attending Oxford during the years of Hitler’s rise to power in the early 1930s. The German officer is part of a cabal hoping to thwart war by getting rid of Hitler. He reaches out to share information with his old friend, seeking help from the Prime Minister. Both men attend the meeting in Munich, both playing their parts while war and peace hang in the balance. “Munich” is subtle thriller, building in intensity as the story builds, while concentrating on a part of history that is normally viewed as short-shifted and notorious prelude to the arrival of Winston Churchill as prime minister.